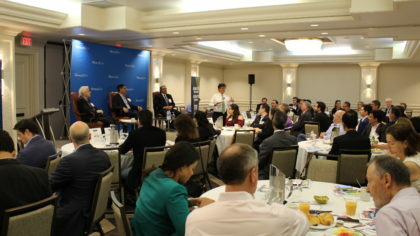 10 Takeaways on Brazil's Dramatic Political and Economic Landscape - WorldCity, Inc.
Click here to view the Facbook Photo Album from the Global Connections event on Brazil and tag yourself if you attended! 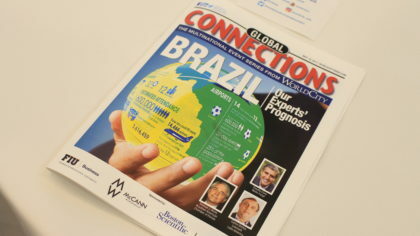 WorldCity’s Global Connections event on the condition of Brazil took place the morning after that nation’s highest court opened an investigation into President Michel Temer following a report that he was recorded approving a bribe for imprisoned former House speaker Eduardo Cunha to “keep quiet”. Those events and more created quite the backdrop for discussion at Global Connections. Not only is the current president in trouble. Brazil’s previous president, Dilma Rousseff, was impeached and her predecessor, Luiz Inácio Lula da Silva, is the focus of the judge who started the investigation known as “Lava Jato,” or Car Wash, Sergio Moro. Two of Brazil’s best-known multinationals, the national oil company Petrobras in particular and construction giant Odebrecht are at the heart of the scandal, which has led to more than 100 arrests and dozens of prison sentences. The Global Connections panel made up of three gentlemen with extensive ties and business in Brazil fielded fascinating political questions but also economic ones from the Miami audience. After all, Brazil is Miami’s top trade partner, with $14.27 billion in trade in 2016, almost doubling the amount of Miami’s next largest trade partner (Colombia). 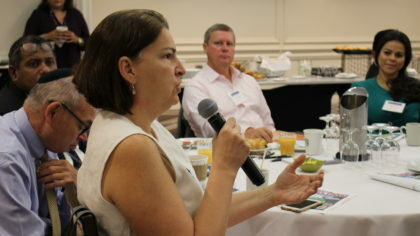 Flavia Vigio, Executive Director for Miami and Latin America at Golin, asks a question at Global Connections. “Do you think what’s happening (politically) gives a bad reputation to Brazilian businesses?” asked Flavia Vigio, Executive Director at Golin for Miami and Latin America. The short answer from the panel was no. Panelist Carlos Bretos noted Brazil is still one of the top-10 economies in the world and 400 of the 500 biggest companies still conduct business there. “There are several things that put Brazil in good perspective, said Bretos, vice president of enterprise sales and general manager at Lexmark Latin America. 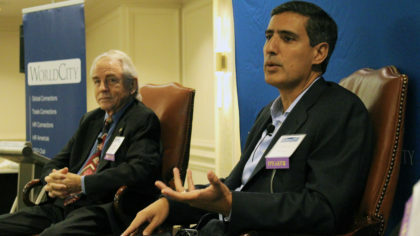 Claudio Cury (right) from Wells Fargo Capital Finance answers a question at Global Connections. “In the past year, we have seen an increase in volume coming from Brazil compared to last year. 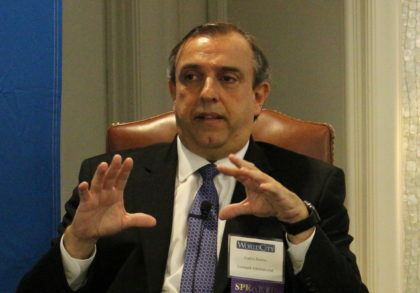 It has been very positive,” said panelist Claudio Cury, managing director of the supply chain finance division at Wells Fargo Capital Finance. The political fallout and the next group of politicians who come to power will play a massive role in dictating whether Brazil moves towards larger economic growth. Carlos Bretos from Lexmark Latin America earned his MBA in Sao Paulo, Brazil. The answer from the panel was Brazilians are resilient. Most indices there were doing well until the latest news of the investigation into President Temer. This year there have been three IPOs in Brazil. Last year there was only one. Locals are investing into the Brazilian economy. Gallardo was in Sao Paulo looking for that warehouse space. Another audience member also chimed in with praise for the panel’s country. 7. Does President Temer finish his term? Thomas Skola, attorney and member of the Brazilian-American Chamber of Florida, adds his legal insight to the current state of Brazil. The panel was asked to make this prediction, with Cury first opining if Temer stays, investments will slow in Brazil. Cury said more than 300 million Brazilian real worth of bribes have taken place (the equivalent of more than $90 million). One senator received 2 million Brazilian real alone. 9. Will former President Lula go to prison? If the events revolving around Brazil’s current president weren’t dramatic enough, its former President Luiz Inacio Lula da Silva is also being investigated for corruption, all the while he sits atop recent polls of 2018 presidential election candidates. However, he also scores the highest rejection rate. 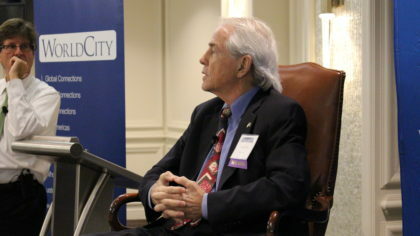 When WorldCity President Ken Roberts asked the panel of Lula’s chances in 2018, Brazilian-American Chamber of Commerce of Florida President Ericson Reis offered his opinion from the audience. “I don’t think Lula is a risk. Lula will go to prison,” said Reis. 10. Will former President Lula be President again in 2018? Lula was a champion for the Brazilian working class in the 1980s, helping end two decades of military dictatorship, before eventually serving as president from 2003-2011. Now, popular anti-corruption judge Sergio Moro has questioned him about potentially receiving a beach apartment in return for helping a construction company win government contracts and hiding ownership of that apartment. Skola said he may be leading in 2018 election polls, but there really are no other candidates right now. Cury said two weeks ago he would have given Lula a 10 percent chance of being president again. Now? “Fifty percent.” Bretos noted Lula’s party did lose a ton of local positions recently. On June 23rd, World City’s Global Connections series continues with “Social Media: The New Power of Video”. The next Trade Connections event will take place June 9th with the release of PortMiami TradeNumbers and a deeper dive into U.S. TradeNumbers.